While righthander Trevor May is the top prospect in the state, and stood out from the crowd for showing a three-pitch mix and solid velocity. He got scouts excited by flashing 92 mph early (with some reports of 94), then settled into the 87-90 range more consistently, and in general was better early in the season. His curveball was his best pitch and could be above-average in the future as he adds power. He has a feel for throwing it for strikes or burying it as a chase pitch. May’s arm works well, though he has some maintenance in his delivery, making it difficult for him to repeat. He’s rangy and has decent athletic ability. He was asking for first-five-rounds money to keep him from going to Washington, and a team that got him crosschecked on a good day could take him as high as the third round. The Phillies liked what they saw, and May fits the profile of the type of pitcher the Phillies generally target. He was tall already as an 18 year old at 6’3 and had a projectable frame, where you could see him adding some size, and in turn, more arm strength and velocity. He’s since grown 2 inches and now weighs in at 215, giving him that ideal workhorse frame. His fastball has also bumped up from 87-90 into the 91-94 range. May is a big-bodied, hard-throwing righthander, and he may have a better change at remaining a starter than Knapp because he repeats his delivery and throws more strikes. He didn’t allow a run in two playoff starts. May wears a size-16 shoe and may not be done growing, so he could add velocity to a 92-94 mph fastball that touches 96 with late sink. He also throws an 80-82 mph curveball with sharp break and a below-average changeup. He deals from a three-quarters arm slot and works both sides of the plate well. BA also ranked him 5th in the Phillies system heading into 2010, a jump of 23 spots. I was even more impressed, ranking him 3rd in the system in my Top 30 prospects for 2010 piece. His 2010 has been a struggle, as he’s had to deal with inconsistencies in his mechanics, which leads to his continued bouts with his control. His raw stuff is fine, his fastball is still solid, ranging from 90-94 and hitting 95 on occasion. His curveball still flashes as a plus pitch, but his changeup continues to need work. The biggest thing holding May back is consistency in repeating his delivery, and throwing strikes. Pitching 2010 at age 20, he was young for the A+ ball Florida State League, and he’s age appropriate now at Lakewood, where he is trying to get himself righted. Scouting Report: Below is a summary of May’s raw tools, graded on the 20-80 scouting scale. These grades are subject to change, obviously. Arm Strength: 60 – May has above average arm strength, capable of consistently pitching in the 91-94 range with his fastball. Fastball: 60 – May’s fastball has good velocity and he has also shown good arm side run (left to right, if watching from the CF camera). He hasn’t been a dominant groundball guy, but he has promise here. Control: 35/45 – Control has been an issue for May. If he is able to smooth out the inconsistencies in his delivery, he should be able to throw more strikes more consistently. Command: 30/40 – Similar to his control, his mechanics create inconsistencies in his release point, which means he has a lot of trouble locating within zone. Mechanics: 40/50 – May is very athletic, which should help him as he tries to iron out the kinks in his delivery. Presently, he has issues, but because of his athleticism, I think its possible to project him to have average mechanics. His arm works well. Durability: 65 – May has not had any injury concerns to date. The Phillies have protected his workload early on, a wise move, and his workhorse frame should lend itself to multiple 200+ inning seasons in the middle of a big league rotation. Secondary Pitches: 45/55 – May’s curveball is a strikeout pitch, with hard and sharp break, but to use it effectively, he will need to get ahead of hitters. His changeup is still a work in progress, and if he’s to remain a starter, he’ll need to develop his changeup to at least the average level. Upside: Despite his hiccup in 2010, May possesses excellent upside, rivaled only by fellow righties Brody Colvin and Jarred Cosart. He has the ideal build for a starting pitcher, with a frame that should lend itself to durability and a power fastball. He is still a bit raw, but has the capability of becoming a solid front of the rotation starter, capable of 200+ innings a year with plenty of strikeouts. Unless his secondary pitches and control improve significantly, he does not look like a true ace, but he’ll be fine as a middle of the rotation arm. 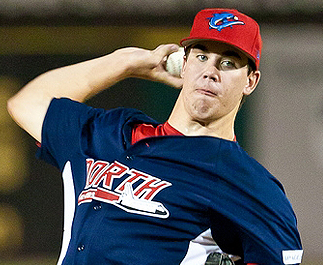 You can see an old video of Trevor May, taken before the 2008 draft, below. If you have more recent video, please pass it along.